BusinessAM is unique. We are not part of a franchise: we’re a one-off, independent, not-for-profit business networking group and our members make all the decisions about how it is run. If you find it hard to commit the time to weekly networking meetings, we meet twice a month on Fridays for breakfast, allowing plenty of time for our members and visitors to forge productive business relationships before getting on with their working days. We believe our £25, one-off joining fee, and £20 a month ongoing membership, offers one of the best-value networking options around. 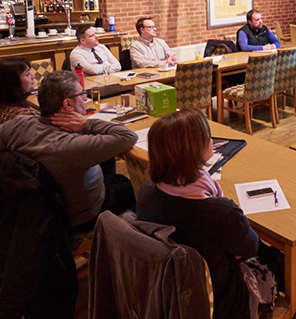 Our meetings are friendly and informal and everyone who attends gets a minute to talk about their business and explain the type of customer referrals they would like to receive. Lots of business gets done in the room and long-term collaborations have been formed by many members. Instead of bringing in outside speakers, each month two of our members take the floor for ten minutes on a rota basis. One ten-minute slot allows a member to promote what they do in more detail while the other ten minutes is an education slot designed to share useful information and advice with the room. Members arrive from 6.45am and chat informally over unlimited tea and coffee, water and juice before sitting down at around 7.15am. All members and visitors deliver their one-minutes and we have the education slot. At around 7.45am we break for breakfast. Members and visitors help themselves from a selection of cereals, fresh fruit and bacon muffins and enjoy a leisurely chat at smaller tables in the room. We reconvene for the second ten-minute presentation, and any other business, before the meeting closes at 8.45am. Members benefit from a public profile page on this website and can also engage with visitors and others on the BusinessAM Facebook Page and Twitter account to keep networking online and building relationships between meetings. Dates and details of future meetings are publicised on our Facebook Page.